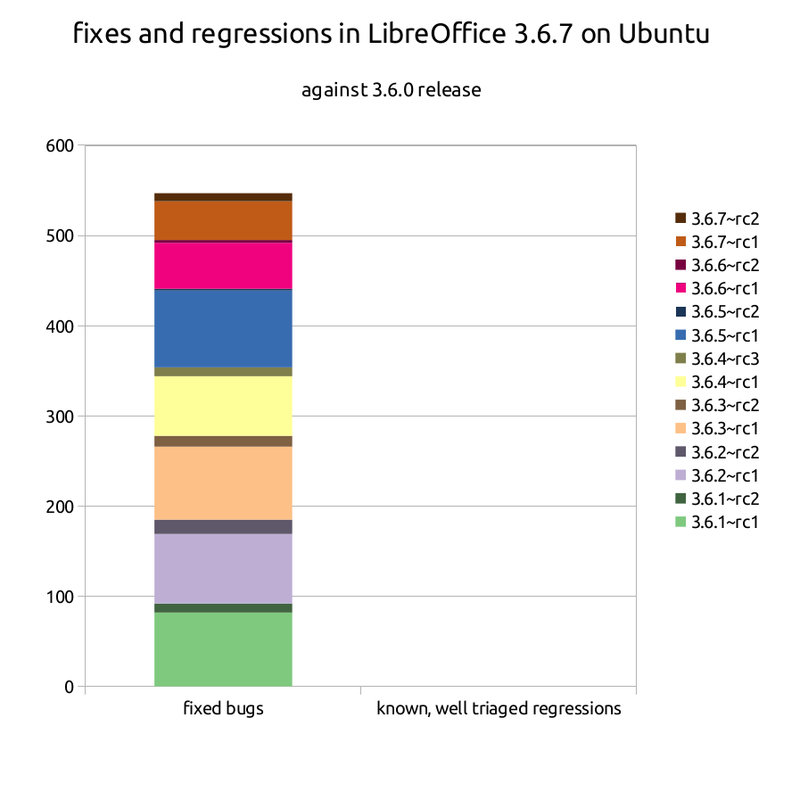 LibreOffice 3.6.7 on Ubuntu: 547 bug fixes and zero known, well-triaged regressions against version 3.6.0 on release – You can't take the sky from me. they are not fixed in one of the 3.6.1 — 3.6.7 minor release updates. At the time of publishing 3.6.7 this query results in bugzilla replying with its infamous “Zarro Boogs found” — so there are no known, well-triaged regressions in LibreOffice 3.6.7 vs. LibreOffice 3.6.0 at the time of release on Ubuntu. Does this mean that LibreOffice will give you a hard guarantee on this? No, the release train model of LibreOffice is more important: It keeps everyone accountable and gives users a reliable date and time for a new release to test and use. So LibreOffice will not “stop the train”, if such a bug candidate is found. If you for example extend the above query to all platforms you will see it return 5 bugs from other platforms. It is unlikely that there are “real” minor release regressions though: those issues are just not confirmed to have been there at 3.6.0 already. So much for the quality of minor releases, but what about major releases? Well, for major releases there is one additional important factor: timely reporting. So lets have a look at LibreOffice 4 regressions that have been filed in a timely manner: That is, between the tagging of the first alpha on November 20, 2012 and the release of LibreOffice 4.0.0 on February 7, 2013. Bugzilla shows that currently more than 95% of these are already resolved, even though LibreOffice 4 will still see a few more minor updates. For regressions reported in the alpha and beta phase before the tagging of the first release candidate on January 9, 2013 its even more impressive: All of those regressions are resolved by now. I assume the statistics for LibreOffice 4.1 to become even more impressive as the LibreOffice bug triage contest was hugely successful and sure will help fast tracking the triage of bugs, getting them ready to be fixed by a developer quickly. Thanks to Joel Madero, Joren De Cuyper and Robinson Tyrone for organizing this awesome event and big “Thank you!” too to all the volunteers taking part in this. Which finally brings us to the little tune quoted at the top-right of the post: The earlier you test LibreOffice and report an issue, the better for you and for the product. With LibreOffice 4.1 approching fast, I invite you to test what will become LibreOffice 4.2 by downloading a daily build, playing with its exciting new features and get involved on #libreoffice-qa while listening to Sir Paul doing his magic on the bass over … Sir Paul doing his magic on the drums.